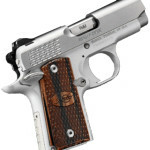 Features: G10 Grips. Night Sights. 7 Round magazine. The newest addition to the Tactical Law Enforcement (TLE) line! The TLE (Tactical Law Enforcement) family of pistols is ideal for duty carry, tactical applications and personal protection. 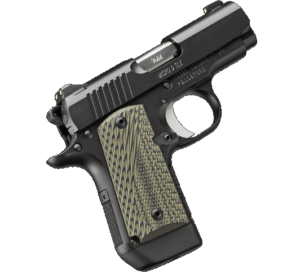 Chambered in 9MM, the Micro 9 TLE features a black slide and frame, green and black G10 grips, and 3-dot tritium night sights. Price: $929 Credit, $30 Shipping by UPS 2nd Day Air! Kimber’s Micro platform – Now available in 9mm! 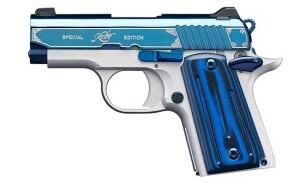 SAPPHIRE Special Edition! Released in the 2017 NRA show: the NEW Kimber MICRO 9 Special Edition SAPPHIRE. 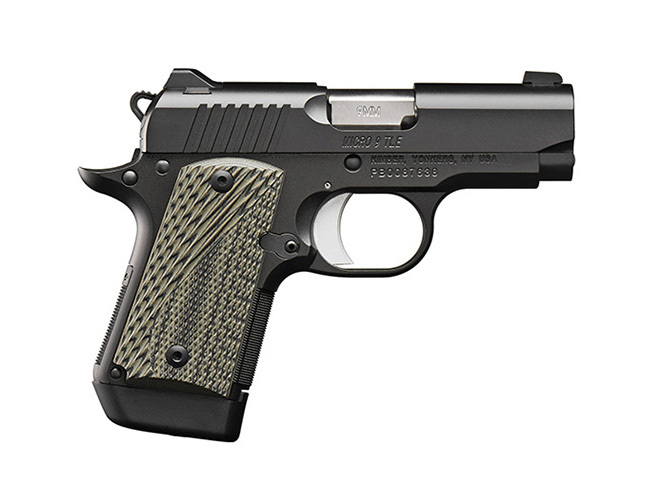 The new Kimber Micro 9 is just slightly bigger that the popular Micro 380. Micro 9 slides are made to the tightest allowable tolerances, with barrels machined from stainless steel for superior resistance to moisture. All Micro 9 frames are shaped from the finest aluminum for integrity and strength. 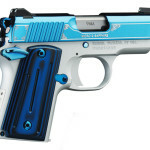 In many respects a miniature 1911, among the most important Micro 9 design advantages is a single action trigger with the kind of short, smooth pull that ensures accuracy and builds confidence. 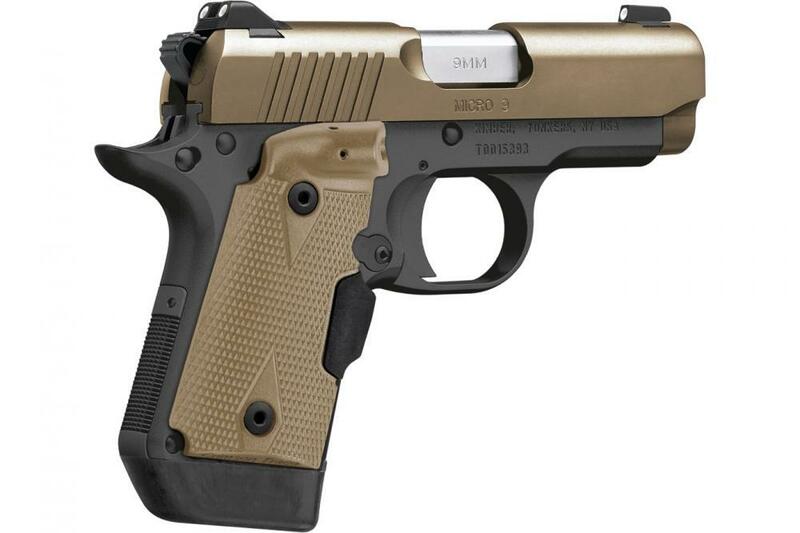 The thumb safety, slide release and magazine release are pure 1911 as well. Standard features include a lowered and flared ejection port for flawless ejection and a beveled magazine well for fast, positive loading. Sights are steel – not plastic – and mounted in machined dovetails for additional integrity. Each Micro 9 includes a flush-fitting 6-round magazine and extended 7-round magazines are available as accessories. This model has in the frame the beautiful Sapphire brilliant bright blue PDV finish with intricately engraved scroll accents and an alloy slide. Topped with Thin blue/black ball-milled G-10 grips. 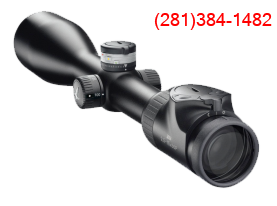 In addition to the looks this gun is all-business with Night Sights and ambidextrous safety. Ideal for shooters that demand small size with mild recoil combined with enough power for concealed carry or home protection, Micro 9 pistols are the right choice for many applications. 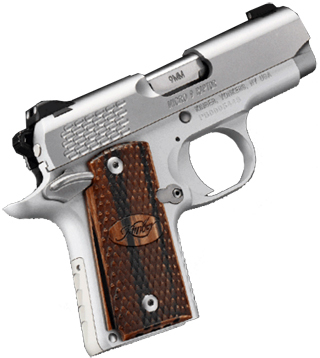 Best of all, they offer unequaled Kimber quality, dependability and performance! Features: Bel Air Color Frame and Stainless Slide. Price: $769 Credit, $30 Shipping by UPS 2nd Day Air! 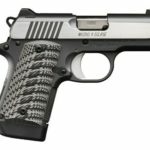 Kimber’s Micro platform – Now available in 9mm! Bel-Air Special Edition! Released in the 2017 SHOT show the NEW Kimber MICRO9 Special Edition Bel Air is just slightly bigger that the popular Micro 380 Bel Air! Micro 9 slides are made to the tightest allowable tolerances, with barrels machined from stainless steel for superior resistance to moisture. All Micro 9 frames are shaped from the finest aluminum for integrity and strength. 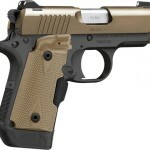 In many respects a miniature 1911, among the most important Micro 9 design advantages is a single action trigger with the kind of short, smooth pull that ensures accuracy and builds confidence. 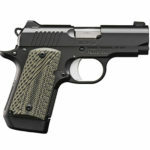 The thumb safety, slide release and magazine release are pure 1911 as well. Standard features include a lowered and flared ejection port for flawless ejection and a beveled magazine well for fast, positive loading. Sights are steel – not plastic – and mounted in machined dovetails for additional integrity. 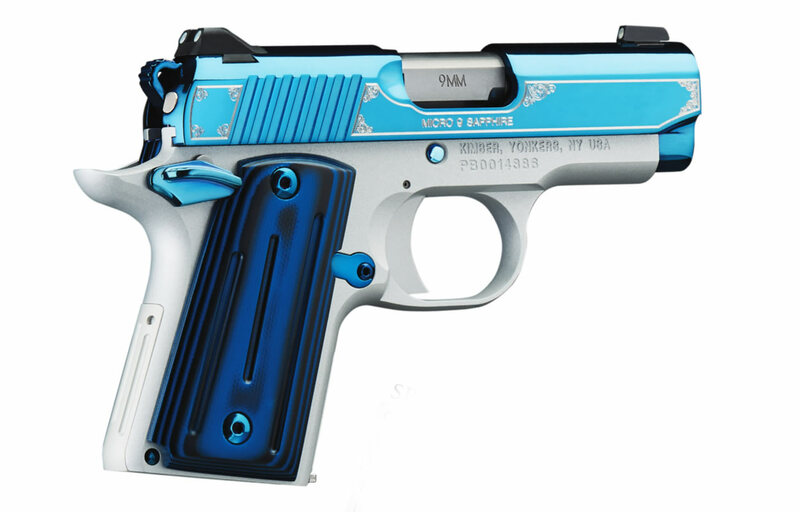 Each Micro 9 includes a flush-fitting 6-round magazine and extended 7-round magazines are available as accessories. This model has Bel Air blue finish in the frame with a mirror polished stainless slide and small parts, topped with superb Ivory Micarta Grips. Price: $779 Credit, $30 Shipping by UPS 2nd Day Air! Micro slides are made to the tightest allowable tolerances, with barrels machined from stainless steel for superior resistance to moisture. All Micro frames are shaped from the finest aluminum for integrity and strength. 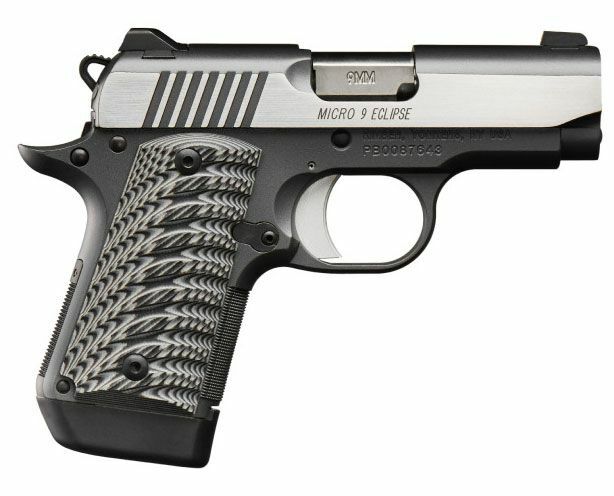 In many respects a miniature 1911, among the most important Micro 9 design advantages is a single action trigger with the kind of short, smooth pull that ensures accuracy and builds confidence. The thumb safety, slide release and magazine release are pure 1911 as well. Standard features include a lowered and flared ejection port for flawless ejection and a beveled magazine well for fast, positive loading. Sights are steel – not plastic – and mounted in machined dovetails for additional integrity. 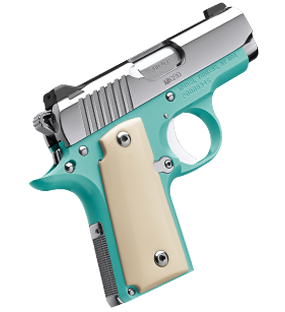 Each Micro 9 includes a flush-fitting 6-round magazine and an extended 7-round magazine is available as an accessory. 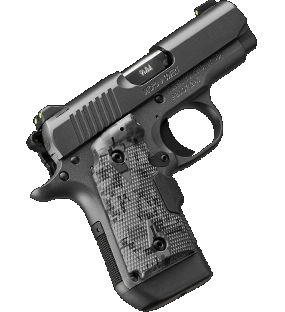 The Kimber Micro9 Raptor STS is one of the more attractive and functional version of the Micro9 with the “Raptor” scaled serrations that make loading and holding the gun extremely easy, night sights and ambidextrous safety! 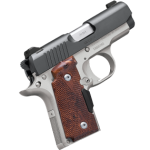 Features: Rosewood Crimson Carry Laser Grip! Price: $779 Credit! $30 Shipping by UPS Air! Released in the 2016 SHOT/NRA shows and finally arriving! 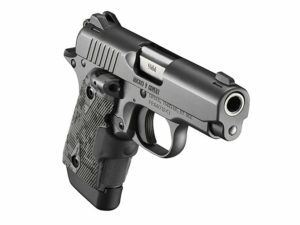 The NEW Kimber MICRO9, just slightly bigger that the legendary Micro 380! Micro 9 slides are made to the tightest allowable tolerances, with barrels machined from stainless steel for superior resistance to moisture. All Micro 9 frames are shaped from the finest aluminum for integrity and strength. 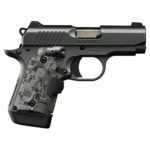 In many respects a miniature 1911, among the most important Micro 9 design advantages is a single action trigger with the kind of short, smooth pull that ensures accuracy and builds confidence. 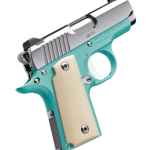 The thumb safety, slide release and magazine release are pure 1911 as well. Standard features include a lowered and flared ejection port for flawless ejection and a beveled magazine well for fast, positive loading. Sights are steel – not plastic – and mounted in machined dovetails for additional integrity. 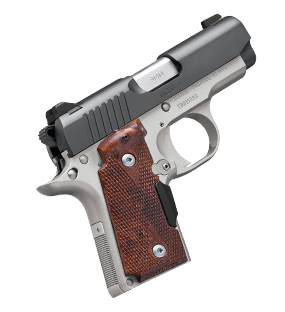 Each Micro 9 includes a flush-fitting 6-round magazine and an extended 7-round magazine is available as an accessory. THIS MODEL INCLUDES A ROSEWOOD GRIP WITH CRIMSON CARRY LASER!